University High School is an accelerated high school located in Tucson, Arizona. University High School’s mission statement is “A special function high school which serves students who are academically focused and intellectually gifted and provides curriculum and social support not offered in the comprehensive high school.” The school shares land and facilities with Ricon High School. University High School students graduate after taking a minimum of 4 Advanced Placement classes. These classes are to ensure that students are well-rounded and ready to begin their post-secondary education. Many students choose to take additional AP courses in order to further accelerate their futures. Keen students will take up to 16 AP courses. Almost all students continue on to a post-secondary institution (college or university) with over 50% achieving scholarships. In 2012, US News and World Report ranked University High School with a gold medal in achievement. The school has been acclaimed critically and nationally as one of the best educational facilities for those looking to get into a premier college. University High School allows students to study and prepare for college and other future endeavors at an accelerated pace. University High School is a public school and entry is based on exam scores and the student’s GPA combined. The GPA is averaged from 7th and 8th grade scores. The only students who are accepted into University Highschool after grade nine are to fulfill the spots left open by students who have left to pursue studies elsewhere. 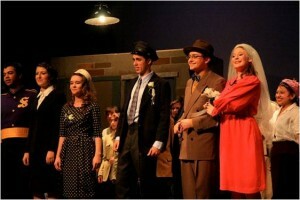 Students can also participate in classes that are offered by Rincon High School and vice versa. The Rincon/ University High School Library allows students a private place to study and research, as well as consult with the librarian for further assistance. 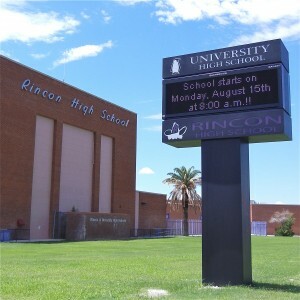 University High students participate in Rincon High School’s athletics and a variety of other programs. 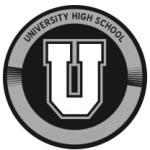 A few extracurricular activities are only offered at University High School which separates it further from Rincon High School. These competitive clubs include Decathlon, Mock Trial, Model United Nations, and much more. Most other school clubs are open to Rincon and University High School students. Some of the more popular clubs at Rincon/ University High School include Culinary, Choir, Anime, Dance, Martial Arts and more. The mascot at University High School is a penguin. When the school was still referred to as Special Projects High School, the mascot was a skunk. Regardless of who the mascot was, they both gave the school its reputable colors of black and white. There are many different sports teams for students to partake in, including cheer, football, cross country, basketball, baseball and tennis. University High School has a very good record of students pursuing higher education at colleges, with over half receiving some sort of scholarship to their college of choice. University High School also has many notable graduates, including but not limited to, Author and Game Designer Thomas Harlan; Vice President for Research and Development at Air Liquide Martha Crawford Heitzmann, and Professional Golfer, Michael Thompson.